A new depiction of anchiornis and its contour feather. 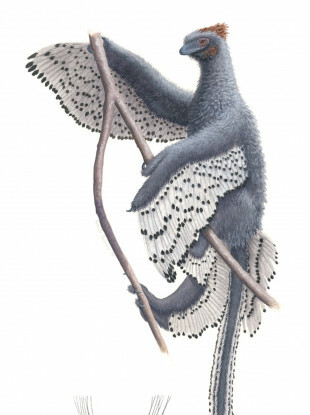 RESEARCHERS AT THE University of Bristol have managed to recreate exactly what the small, winged dinosaur anchiornis looked like hundreds of millions of years ago. The anchiornis is an example of a paravian, which were feathered, carnivorous dinosaurs that birds are descended from. The velociraptor is also from this family. The team examined a well-preserved fossil of the crow-sized dinosaur and compared its fossilised feathers to those of other dinosaurs and extinct birds. They found that the anchiornis had a newly-described, extinct, primitive feather form that consisted of a short quill, with long, flexible barbs erupting from the quill at low angles to form two vanes and a forked feather shape. This would have made the anchiornis a lot fluffier compared to modern birds. The primitive nature of its feathers would make it tricky to control temperature and repel water, compared to modern bird feathers. To compensate, these dinosaurs had four wings, with long feathers on the legs and arms to allow them to glide. The researchers then worked with scientific illustrator Rebecca Gelernter to reconstruct what the anchiornis would have looked like based on their findings. They said the result “represents a radical shift in dinosaur depictions and incorporates previous research”. Evan Saitta, from Bristol’s school of earth sciences, said: “The novel aspects of the wing and contour feathers, as well as fully-feathered hands and feet, are added to the depiction. Overall, our study provides some new insight into the appearance of dinosaurs, their behavior and physiology, and the evolution of feathers, birds, and powered flight. Email “Scientists have managed to recreate exactly what this fluffy, toothy dinosaur looked like”. Feedback on “Scientists have managed to recreate exactly what this fluffy, toothy dinosaur looked like”.